Today, September 25, is the official publication date for my book, A Year of Living Kindly. I wouldn’t be writing those words if it weren’t for you. Really. And I want to thank you from the bottom of my heart. And offer you cake. When I started this blog in January 2015, my intention was to explore kindness in both scholarly and experiential ways, and—I hoped—become kinder as a result. I chose to blog, thinking it would keep me accountable. After all, if I had an audience for my intentions, it would be both noticeable and embarrassing if I abandoned my “year of living kindly” around the ides of March. That interaction made me a better blogger—also a better writer and thinker—and it also strengthened my resolve about kindness. I can honestly say this is the kindest community in all of social media. In nearly four years, I have not had one unkind or inappropriate comment. I had been warned that some nasty people were lurking, people who got their kicks from demeaning the ideas and opinions of others. But even on those occasions when I shared my most heartfelt political views, still no one was vicious or contemptuous in return. I confess to an occasional slight (very slight!) disappointment, for I counted on at least a couple of trolls to test my resolve to respond kindly to unkindness. But people were universally kind. 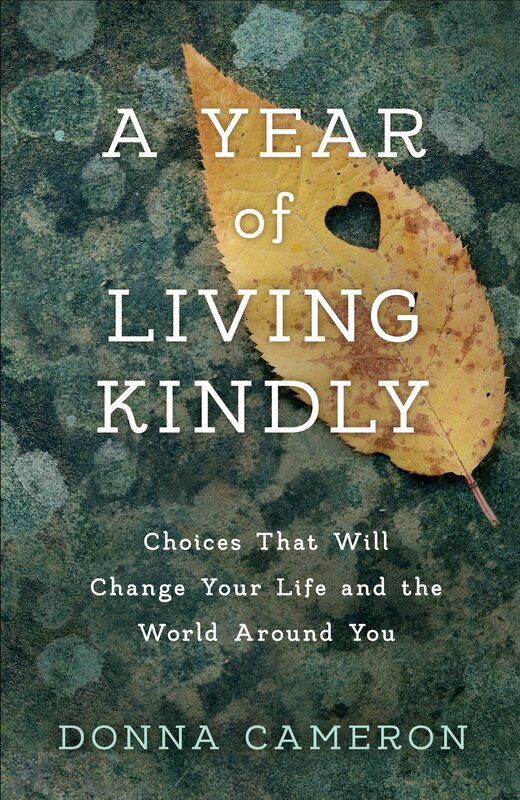 At the end of 2015, when my official “year of living kindly” concluded, it was many of you who urged me to take my ideas, observations, stories, and research and turn them into a book. One of you even enthusiastically offered to be my beta reader—a gift I accepted with awe and am grateful for every day. So, here we are. This happened. On October 10, I will be having a book release party at Third Place Books in Lake Forest Park. For those of you who are close to Seattle, I hope you will come and share this evening that you helped bring about. There will be cake. For those of you in far-flung locations, I hope you will hoist a glass in your honor and also indulge in a piece of your very favorite cake. For that particular piece of cake, there will be no calories. I have that on the best authority. My hope for this book is that it will inspire people to claim the strength of their kindness and through their kind actions and the ripples that flow from them, the world will be changed. And you, my dear friends, made it happen. This entry was posted in Books, Generosity, Gratitude, Kindness and tagged Books, Extending Kindness, Generosity, Gratitude, Kindness by Donna Cameron. Bookmark the permalink. So glad to hear . . . I wish my husband followed my suggestions so readily. But we are talking cake! Thanks! Thank you, Fransi! I hope you and your friend like it. I am so looking forward to the day when kindness isn’t something we remember wistfully, but it’s all around us, and simply who we are. I’ve ordered them and they’re on their way. Can’t wait to dig in. I’m with you Donna — I look forward to that day! Congratulations on getting your first book published! I’m looking forward to reading it. Thanks, Tim! I don’t know if you recall, but you were one of the big encouragers as I started this journey. So much has happened since then; I’m grateful that you’ve stayed connected. Donna, thank you for saying that. And for continuing your journey in kindness so transparently. CONGRATULATIONS, Donna!!! Reading your blog and getting to know you through our email chats has a cherished place in my heart. I can trace so many positive changes and experiences I’ve had these past few years back to your words here and the deeper understanding I gained of kindness and its inherent wisdom and gentleness. May your book have the same effect on many, many others too! Nancy! Connecting with you through YOLK, and as my beta-reader, AND as my friend, has been such a gift. Thank you for all of these gifts, your generous spirit, and for your good wishes for the book. Wish I had the technology to transport cake to you! And YOU are amazing, my dear friend. Congratulations! Your thoughtfulness, your thoroughness, your talent, hard work and commitment have come to beautiful fruition. Above all, your kindness and your faith in the better angels of humanity have been — and will continue to be — much-needed inspiration in this anxious age. With much love & admiration, Hurrah! Kris, I don’t know if any of this would have happened if we hadn’t teamed up a few years earlier to write One Hill, Many Voices! Collaborating with you was a master class in writing and being human. And your ongoing support, encouragement, and—especially—friendship has been the icing on the cake (I seem to have cake on my mind). Thank you for your kind words and your treasured friendship. Lunch soon? My copy of your book is supposed to be delivered today – it will be a much-needed balm to these aggravating times. I enjoyed, too, listening to your podcast interview with Dirt in Your Skirt. It was so nice to put a voice to your words! Congrats and best wishes! Thank you, Michelle! Yours was one of the first blogs I signed up to follow in 2015 and it remains one that I always look forward to reading and thinking about. I also remember your generosity in introducing “unknown” blogs to your readers–that’s how many found me, and how I found some wonderful blogs to follow. Thanks for your kind wishes. I got my book, I got my book! Starting to read it tonight. Thanks for letting me know! Hope you enjoy it. Thank you, Cheryl! Enjoy the cake! Congratulations Donna. Kindness does win! Yes, it does! And I think it always will. Thank you! Thankfully. Thanks for promoting it. I look forward to reading your book. Congratulations on your new Kindness book coming out…! I’m soooo excited for you…! Also your TV interview went great… You came across as well-spoken and knowledgeable…and presented yourself very well. Good job with the interview…and thanks to Bill for the link. I think for the ride back home…both you and Bill had the biggest smiles I can imagine…! Again…a big congrat’s…and for the sake of our country…maybe the world…I hope you sell a billion copies…and Kindness ripples through the Universe as an unstoppable wave…!! You’re right about the ride back home, Robert, but for a very different reason. Very shortly after we got to Seattle, there was a massive truck fire that closed the entire freeway just before the exit we had taken. All five lanes were a parking lot—with people just walking around, and the highway backed up for miles. If we had been just a few minutes later, I would have missed the interview! Thank you for all your kind words and your kind wishes . . . and for being one of my oldest and dearest friends (I mean oldest in the length of our friendship, not your age, of course!). I love the notion of an unstoppable wave of kindness (I’m okay with the “sell a billion copies” idea, too). Thanks, my dear friend. Congratulations, Donna! I wasn’t planning on having dessert… but if you insist. I wish we lived close to Seattle so we could celebrate with you. Thanks, Janis! Think of the cake as health food. I often wish Seattle weren’t so distant from San Diego–for many reasons, but one is that I would love to meet you someday! Congratulations on the release of your book! Isn’t it amazing how much support we get from the blogging community? I was also afraid of all the negativity, but it just didn’t materialize. I think creative people just naturally support each other, because we understand how hard it is to put our work out on a public blog. You write very well, and I am so happy for you. And yes, I’ll have a piece of cake in your honor, since I’m too far away to come to the event! You make a really good point about creative people supporting one another. I think we recognize the vulnerability of putting our thoughts and intentions out in a public forum. The people who really get their kicks from attacking others don’t want to read long pieces and make thoughtful comments. That’s probably why so many hang out on Twitter. Though, having said, that, I have found a large, kind, and supportive community on Twitter, too. Thank you, Ann! Marianne, you’ve been such a guide and role model on this journey. The connection to and support from SWP sisters has been one of the best parts of the process. You were the very first one I met and you set the tone for this year of wonders! Thank you. Looking forward to seeing you on the 10th! Well done, Donna! If I lived anywhere near you I’d be there! Thank you, Mick, for all your support and encouragement! Thank you so much! I so appreciate your kind words and your purchasing the book. I hope you and your friend enjoy it. Looking forward to future connections. Congratulations on the publishing of your book. We are all aware of your sacrifice and dedication. Step one has passed, now onto step two. Thank you for your good wishes. Not a whole lot of sacrifice on my part–it’s been an incredibly joyful journey, from which I’ve gained beyond measure! Can’t wait to see what step two is like! I wish you could see the size of the smile on my face right now, Brian. Thank you! Thanks so much for your kind words and good wishes, Jet! Donna, I appreciated your distinction between being nice and being kind. Actually, as I kept reading I began to see “kind” as a verb! Kindness is your nice on steroids. It’s active, leaning into your nice. Kind is proactive and doing with intent. Good stuff. Thank you! Thank you, Dan! Thinking of kind as a verb is an intriguing idea–it’s like the difference between being and doing. While we may “be” kind, that kindness is manifested in “doing” kind. Hmmmm. As always, you give me something to ponder. Thanks for commenting. Thank you, my friend, for your kind words and your good wishes. And I am looking forward to somehow making my way to the Midwest where the Three Musketeers will finally unite! Then, watch out, world! Many congratulations. I am trying to crawl out of a pit I’ve apparently crawled into and made my slovenly home for the past month. So, I missed a few (dozen) announcements here or there. It was nice to find good things are happening to people–even if they are not me. The excuse to eat cake with no calories is duly adopted. I shall toast you soundly with something slathered in chocolate ganache. Even if I have to drag it back to my hole and cuddle in the dark with it until I can rise again. Coincidentally, one of the cakes I have ordered is slathered in chocolate ganache! (The other is apple with a caramel buttercream frosting, but don’t tell anyone!). Thanks for your congratulations and good wishes. I hope the light comes back into your home and your life soon. It sounds like you’re due for some joy. Let the universe take note! Thanks so much for taking the time to read and comment. Congratulations. Well done. You give me the drive to keep working on that book of mine. Yay. Oh, yes! Do keep at it–the process and the aftermath are hard work and also abundantly joy-filled. Enjoy both! Yay to you! Thanks, Lisa.